I painted the background of today’s watercolor first (sans disks), without and idea of how the composition would develop. Since I am working with inked lines lately, I noted several color boundaries that cried out for defining lines. I began with the border of the yellow and worked outward. Some of the lines echoed the arrow shape, but I angled the top set of lines in opposition to the outline of the arrow. The circle at the bottom left counterbalanced those lines. The other two disks suggest a beginning and end of the lines of force, or the trajectory of the yellow arrow. 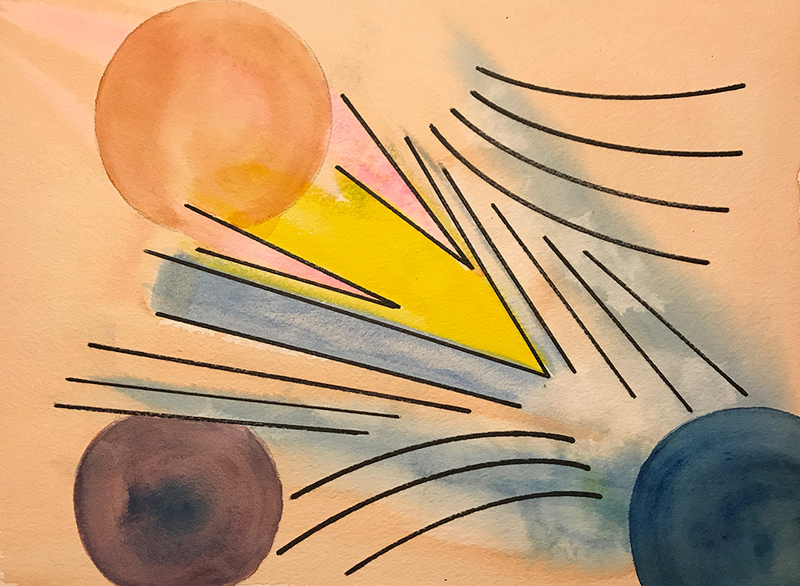 This entry was posted in Personal Stories and tagged abstract art, artistic process, creativity, disks, ink, lines, painting, trajectory, visual arts, watercolor. Bookmark the permalink. I love this. I can’t decide if they are repelling or attracting each other. The tension among them is perfect.